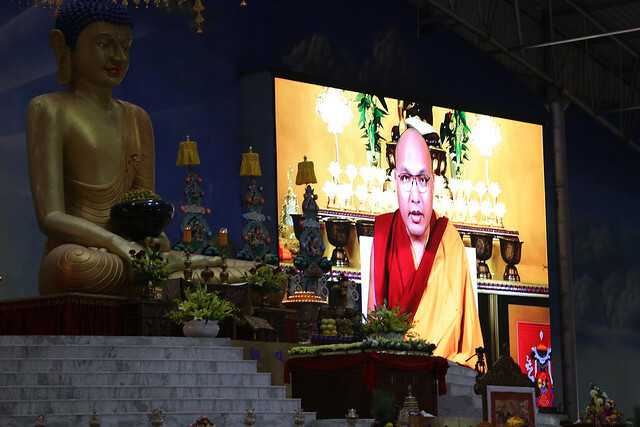 On the final day of the main Monlam, shortly after 3.00pm, speaking from the USA, the Gyalwang Karmapa once more addressed the gathering in a pre-recorded video. 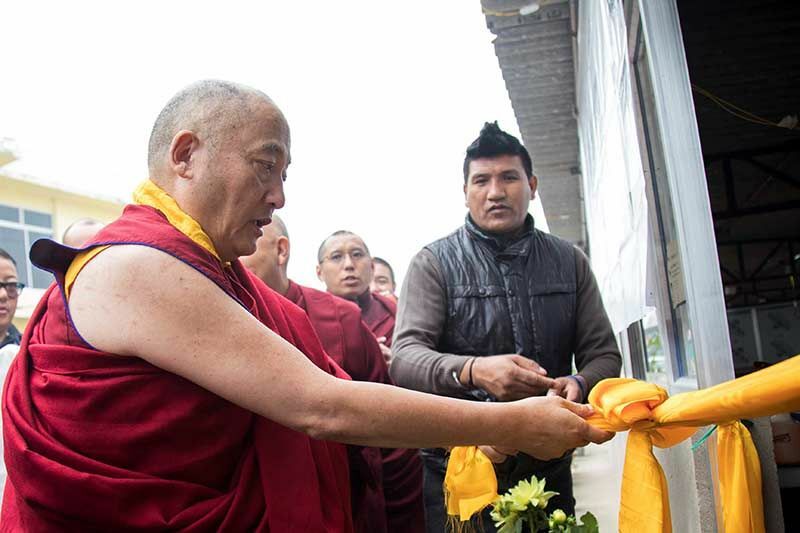 He thanked Goshir Gyaltsap Rinpoche and Kyabje Mingyur Rinpoche for their great efforts, and then thanked every worker and participant, both monastic and lay, for making the Monlam so successful. 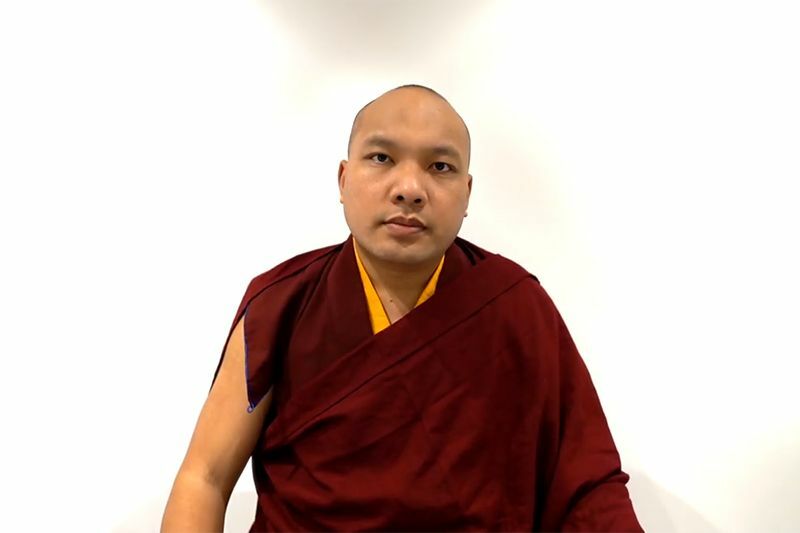 The Karmapa went on to talk of his hopes and concerns on a personal level, with respect to the Karma Kamtsang, and for the Kagyu lineage in general. As promised in his first message, he also gave the specific reasons for his unavoidable absence from the Monlam this year. 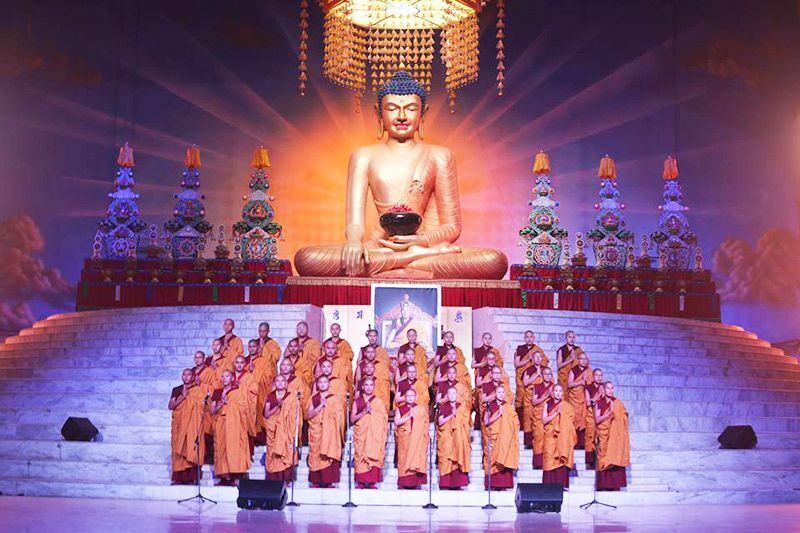 Finally, he led everyone in reciting the Great Aspiration Prayer which dedicates all the merit accumulated during the seven days for the well-being and happiness of the world and all sentient beings. Today is the last day of the 35th Kagyu Monlam Chenmo, and, just as I have requested of him, this year His Eminence Goshir Gyaltsap Rinpoche has gone to incredible efforts to come and preside over the Kagyu Monlam. 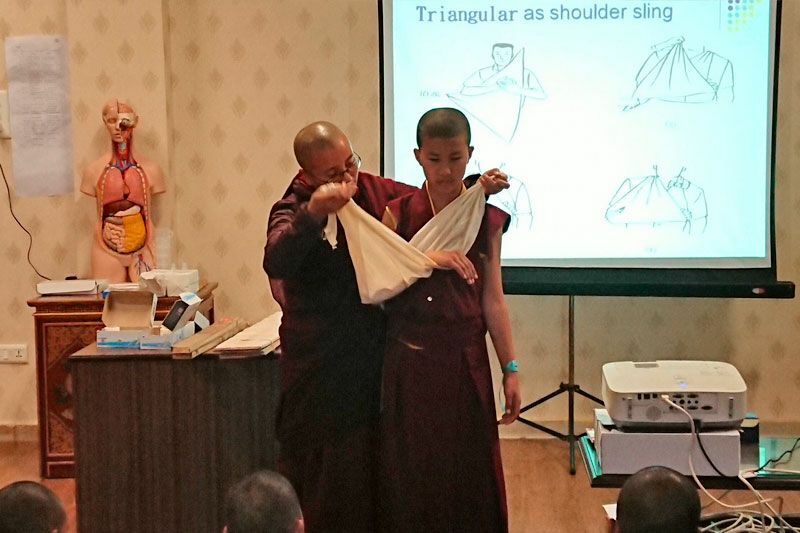 Our original plan was that Rinpoche only needed to attend a few of the most important events and did not need to come to everything, but Rinpoche has come to preside over the sessions whenever he could, without missing a single day. This is extremely kind of him, so on behalf of all the monastics and lay people who have attended the Monlam, I would like to express my deepest thanks to Rinpoche. Likewise, Kyabje Mingyur Rinpoche showed us the kindness of giving meditation instructions during the Pre-Monlam teachings. Since then, during the time of the Kagyu Monlam, Rinpoche has also put in a lot of effort to come to many of the different events, both large and small, so I would like to thank Rinpoche on behalf of everyone. 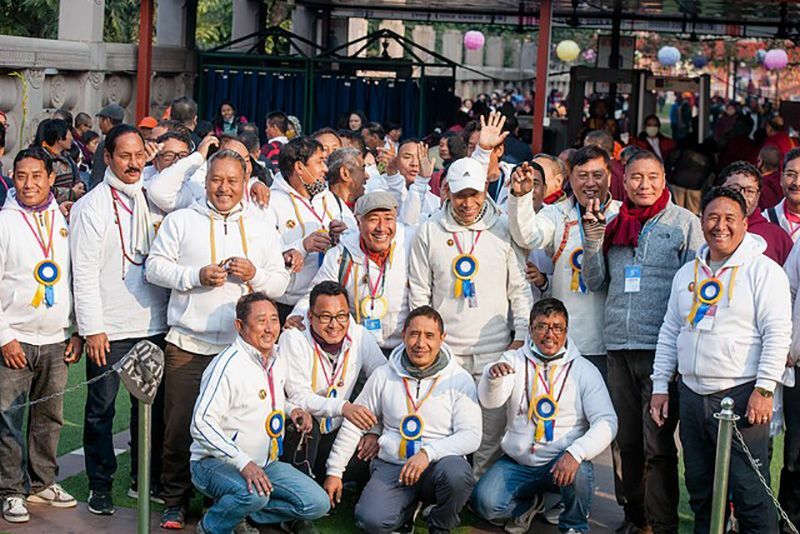 This year, even though I was not there, everyone in the Monlam Organizing Committee has taken on the responsibility for their individual teams, working co-operatively just the same as they would if I were there. The results their work has produced are no different from how they would have been were I there, so I would like to take this opportunity to give my heartfelt thanks to Lama Choedrak, foremost among the Monlam workers, and to all the other workers as well. Thank you very much. Likewise, the monks and nuns from the various monasteries, despite the fact that the weather has been very hot, have been exemplary and praiseworthy in all respects during this Monlam, in terms of their motivation, conduct, and everything else—even in the heat. So I would also like to say thank you very much to all of you as well. Similarly, the faithful people who have come from abroad. This year there have been many changes in the Monlam dates, and this has caused you difficulties financially, and once you had arrived here, the weather has been hot, and that has added to your difficulties. But your participation makes the Kagyu Monlam into an international event. I think it shows that, no matter where we are from in the world, our wishes are in unison; our wishes for world peace are in unison; our wishes that all sentient beings may be happy are in unison. So I would like to thank you all deeply. Likewise, the place where we hold the Monlam is the sacred site of Bodhgaya in the Noble Land of India. The Government of India, the federal government, as well as the state government of Bihar and the local administration have all provided a great deal of assistance. Likewise, the administration of the Mahabodhi Temple has also continuously supported us, not only in the past but also in the present. I would like to take this opportunity to express my appreciation and thanks to all of them. At first I thought I didn’t need to say too much today. But now I think I could take this opportunity to say a few things and it might be beneficial. The main thing to mention is that many people have been asking when the 36th Kagyu Monlam will be held. In addition, they are asking that the time be fixed and not changed. Quite a few people have said this. On our part, we have gone to a lot of effort to have a definite schedule that did not change, but sometimes it happens that there are events with other lamas, other great lamas, or Monlams from other lineages being held at the same time. When they conflict with each other, it is not very easy for us or for them. For that reason, we have had to postpone or change our dates several times. Even though we haven’t wanted to reschedule, there have been situations where we have had no choice but to do so. We are, however, doing everything we can to avoid having to change our dates in the future. In the next few days, we will have meetings to decide a fixed time for the Monlam. We will have free discussion about the schedule in the meeting and do our best to make a decision as soon as we can. Once we have decided, we will announce it immediately over the internet so that everyone can make preparations in advance to come to the next Monlam. We will try our hardest to inform you as soon as possible. This year I did not have the opportunity to attend the Monlam in person. However, as I have already said, the Monlam has been excellent and well organized, no different than if I were there. As I reflect back, I was recognized as the Karmapa at the age of seven, and then, at the age of fourteen, I was separated from Tibet and came to the Noble Land of India. Thinking about how it was, I went from being a little boy who didn’t really understand what a Karmapa is, to being brought and put on the Karmapa’s throne, and gradually having to take on the responsibilities. When I think about the sequence of events, from my perspective, the Karmapa has a history of over nine hundred years and there have been sixteen incarnations. To have qualities of abandonment and realization such as they had and activity such as theirs is something I don’t even dare to hope for, and I do not believe that it will happen. Yet, because I have received the blessings of the Karmapa to some degree, I have done my best. I have done my best, but I am an ordinary person, so no matter how hard I try, there are many situations where that is not enough, where it is beyond me. Many people think that merely by being the Karmapa you become some incredible person, but for me, that has not happened. Even if I am the Karmapa, the situation is that I still need to try really hard. Gyalwa Götsangpa said that even the rebirth or reincarnation of a lama or tulku should spend twelve years of purification, practicing meditation to purify remaining obscurations. It is necessary to practice meditation and accomplishment in retreat. Therefore, even if one is the tulku or reincarnation of a great lama, you still have to put in such efforts. For me, I don’t have any reason or basis to say that I am the reincarnation of a great lama. Since I am an ordinary person, I have to put in an incredible effort, even more than other people. But no matter how much effort I make, it’s never enough; it never reaches a level where it is sufficient. This is because people have such high, limitless hopes in me. On my own part, I do my absolute best to try to live up to them. And I do this to the best of my ability with a pure motivation. When I was little, a lot of people would come to give me advice. “You must be careful. There are many people who are said to be the Karmapa, so you have to be your best.” So many people said this, but from my own part, I never had the motivation to be careful, even when I didn’t want to, just because I needed to compete with everyone else who is said to be the Karmapa. From my own part, I have had a pure motivation, whoever I am, making my best efforts, no matter what. Even when I was studying in Tibet, the way I was served educationally by my teachers and such was not all that excellent. One reason I came to India was to study and to receive the dharma lineages. That’s why I came. So once I arrived, it should have been better than it had been in Tibet, but in terms of my education there were many gaps. From one perspective, the fault was my own for being too lazy. Also, I am pretty smart, and since I am pretty smart, no matter what I study, I immediately get a little bored, and think, “I get it”, and immediately lose interest. In addition, there were problems concerning the lamas and khenpos with whom I studied. We invited the best lamas and khenpos from among the Kagyu, but they all have their own monasteries and dharma centers that they have to maintain and take care of. They have their own activity, and so were unable to spend all their time with me. For these reasons, sometimes I would have classes and sometimes not. This happened frequently. In the past, I had the thought that if I went to a Gelukpa monastery, matriculated so to speak, and followed their curriculum, I would have become a good scholar. But later when I thought about it, if I had gone to a Gelukpa monastery and gone through the studies, on the one side there would be nothing wrong with that, but on the other, since I have the title Karmapa, if the Karmapa were to go to a Gelukpa monastery and study, in the future there would be a problem in historical terms if the head of the Kagyu lineage were to do so. Of course I have had many different discussions with Gelukpa geshes, but I have never matriculated in a Geluk monastery. So this is one issue. My own studies have not been all that high-quality or good. Mainly, what I know now has come from my taking interest and putting the effort into it. I have never had a properly organized, thorough education. That is one issue. Another issue is that when I was recognized as Karmapa at the age of seven, I was just a little boy. From the time I was small, I grew up in Tsurphu Monastery. When I was little, all the people around me were adults. So I had to do whatever they told me to, and couldn’t say what I needed to do. At first, of course, I didn’t know what I should or shouldn’t do, and in addition to that, other than listen to them, I never had the freedom to say what I should or should not do. Actually when I was little, I did have a lot of hard times. For example, in terms of power, the chakdzö held all the power, and when people came to give me gifts, they first had to take them to the chakdzö, who would open all the gifts first. In those days, people were suspicious there might be a bomb or poison or something, and so they would take the gifts away to make sure there was no bomb or poison. But once the gifts had been taken away, they were never brought back, almost all of them. Also people would come and give money and say it was for me to give to my parents. Those who knew my situation would give the money surreptitiously—at that time, there were always a lot of people around, and without them knowing, they would quickly slip it under my cushion secretly. That’s what it was like when I was little. I never really felt that I had any freedom of my own. Then I came to India. India is a free country, a democracy, so I had hoped that once I arrived I could do whatever I wanted. That was my hope. But when I first got to India, none of us knew anything about India. At that time, among the people who advised me, even though they definitely had pure motivations, there was no one to guide me who was one hundred percent reliable. They did not know how things were done. Consequently, I had no advisors, so when we first entered discussions with the Indian government there was disharmony and disagreement, and this probably caused some suspicions. In any case, I have spent eighteen years in India, and during this time I have had continual difficulties and hassles, as you all know. They said I was sent by the Chinese, that I was a Chinese spy. Many things have happened but in spite of this, I have done what I could. The reason why I have continued to push forward, despite all this, is that I feel that I must not give up on the teachings, the Kagyu teachings. Likewise, I have thought to myself that this is for the benefit of Tibet and the benefit of all sentient beings. Thinking in this way, I have continued. From another perspective, when I arrived in India, I was very fortunate. I had the great fortune to meet His Holiness the Dalai Lama and hear his teachings. I had many opportunities to receive profound dharma teachings from Chamgön Tai Situ Rinpoche and Goshir Gyaltsap Rinpoche. Likewise, I have had the opportunity to receive profound dharma teachings from Tenga Rinpoche, Bokar Rinpoche, and Yongdzin Thrangu Rinpoche. I do feel that all of this has been very fortunate. But I live at Gyuto Monastery and the heart sons live elsewhere—Situ Rinpoche lives in Sherap Ling and Gyaltsap Rinpoche lives in Sikkim. There has never been an opportunity for us to spend an extended period of time in the same place. It’s as if we have all been scattered. When I read the lives of the previous Karmapas, the Karmapas and their heart sons all stayed together. Wherever they went, they were together, whether it was teaching dharma, or whether it was taking care of each other. At that time they all took care of each other, but this never happened with me, and I feel very disappointed about this. Then to speak bluntly, after the 16th Karmapa passed away, we had a great rift in our Kamtsang lineage. I don’t need to say anything more about the old situations. Because of this, we do have some disagreements among the Labrangs. Many things have happened since I arrived in India. Some of you know; some don’t. There has been a lot of disharmony among the Labrangs, and this has also caused me a lot of concern. On one occasion, I invited Chamgön Tai Situ Rinpoche and Goshir Gyaltsap Rinpoche to come to Delhi. Both Rinpoches are like moons in a cloudless sky and are not stained by any faults. But I did ask them to tell their attendants and the people under them that we have already had a great disaster in the Kamtsang lineage. We’ve had a huge conflict. We have had a terrible violation of samaya. I asked both Rinpoches to tell them to please do what they can to avoid that again, and they promised to do as I asked. Actually, to make such a request is like teaching Avalokiteshvara the Mani mantra; one shouldn’t make such requests. But I was too petty and too small-minded and asked. Also, thinking that it might be of benefit to the Karma Kagyu teachings, I went to see Kunzig Shamar Rinpoche. At the time of the meeting, on our side, our people said that it was not good to make that connection. Quite a few people said this. Some who were near to me said this vociferously. But that made no difference. I thought about the good of the teachings and went to meet Shamar Rinpoche. When we met, there was really no specific result that you could point to. However, now that Rinpoche has passed away, I do feel a bit of comfort in my mind that I was at least able to meet him and tell him what I thought. Generally, we all know how important the Shamar Rinpoches have been in the history of the Karma Kagyu. But in the past few years or decades, so many events have occurred that many people say we should not recite long life prayers for Shamar Rinpoche and that we should remove the Shamar Rinpoches from our lineage supplications. I think that this is not really seeing the important points, because Shamar Rinpoche is more than the 14th Shamar Mipham Chökyi Lodrö. The Shamar Rinpoches are part of the ultimate lineage of our Karma Kamtsang, a lineage from Thongden Drakpa Senge to the present. It is not a single person’s name; it is not a single person. Thus no matter how much people say that the actions of the current Shamar Rinpoche were wrong, I think we must not paint the activities of the Shamar lineage black. For this reason, I think that we must have a positive way of thinking about Shamar Rinpoche. I think we need to consider Buddhism in general and the future of the lineage. Now that Shamar Rinpoche has passed away, it is extremely important that there be no problems regarding his reincarnation. If we have another situation where we say there are two different reincarnations, it will harm the Kamtsang teachings in general, and in the future the Kamtsang will split into two factions, viewing each other as enemies. This would not be good in any way at all. In the depths of my heart, I think we can have reconciliation, and I am doing a few things to bring this about. But it is not something that one person can do alone. It is crucial we remember that both sides need to be open. If we continue to always say bad things about each other and criticize each other, I do not think it will turn out well. Our teachings, the Kamtsang, are the same. Our gurus are the same. The color of our hats is the same. But if, despite this, we continue to cling to our own factions, no matter how right we are, we will have such bias toward our own side, that we will work to win for ourselves and defeat the others, and taking this on would be a complete mistake; there would be nothing good about it. We often say that there’s the Shamar side or the Situ side: one side or the other. Actually, we aren’t on the Situ Rinpoche side; we aren’t on the Shamar Rinpoche side. We are all on the side of the Karma Kagyu. If instead we are filled with our own afflictions—the three poisons—engage in partisanship and jealousy, and simultaneously say “I’m on Vajradhara’s side,” there is no benefit at all. These people say, “I’m pure, he’s pure. He’s a pure Kagyupa. But they’re not pure.” Whether one is pure or not comes down to the practice we have in our mind streams. It does not come down to whose side we are on. I think this is something we all need to keep in mind. Another thing is that I am in America. I’ve spent many months abroad, the last six in America. There are probably a lot of people who will explain the reasons why I have stayed abroad for such a long time. But independent of anyone else’s explanations, what I’d like to say is that the main reason I am staying abroad is that when I had a medical exam in Germany, they told me I had a medical problem. Then I had to go to America for the sake of my elderly attendant, and once there, I had to follow up on the medical problem that they had told me of in Germany. That is the reason. Another issue is that, for many years, I have never had the opportunity to really rest—to rest both the body and the mind. Once I arrive back in India, there will be a lot of busy-ness and franticness, so I will be unable to rest. So I have stayed here to rest. I have stayed here because I am considering the long-term. Probably many people have said that I am staying for my own personal benefit or that I have some insidious plan, but that is not it at all. In brief, whatever decision I make or whatever I do, people think, “He’s the Karmapa. Of course it is so.” But for me, it’s not definitely a matter of course. No matter what decision I make, no matter what I do, there is a lot I have to give up. For my own part, up to now, I have done everything I could with a pure motivation. But people will make things up. There are many people who make things up out of dislike. There’s nothing to be done about that. But many of our own people give incorrect explanations because they either do not know or do not understand what my real intentions are. Especially, now that I am staying in America, even the people around me have had a lot of ideas. Likewise, many people all over have had a lot of different ideas. This makes me very sad and disappointed. This is because, when other people look at what I have tried to do, they take it as a matter of course. But for my own part, I have had to give up a lot, and none of it has been easy. When I ignore the fact it is not easy and keep pushing ahead, if those around me do not believe in me, there’s no reason for me to pretend and keep going. This makes me sad. From a future perspective, from the time of the First Karmapa Dusum Khyenpa to the present, the Gyalwang Karmapa has been a lama who has engaged only in dharma activities, not one who has been involved in politics. Now we are at a critical time for the Snow Land of Tibet, and we have come to a point where it is important to put efforts into both dharma and politics. For this reason, we definitely need a political guide or leader. But I don’t know how to give political direction. Not only do I not know how to do this, but since I have the title of Karmapa, it would not be appropriate. The way I think is that one engages in politics to accomplish short-term aims and benefit. In addition, politicians are always changing. Politics is partisan; dividing into factions and seeking profit and benefit for your own faction. But dharma means not dividing into factions and instead bringing benefit to all sentient beings that are as limitless as space. Its duration is such that people do not change posts immediately. Dharma is for protecting ourselves in this and future lifetimes and for guiding ourselves now and in the hereafter, so dharma and politics work in a completely different way. Since I have the responsibility of being a religious leader, I can only continue in the direction of the dharma. When I was in Tibet, I was worried I would have to get involved in politics, so I went to India. Once I arrived there, I’ve always thought that, if it came to my having to do political activities, I would not have the skills to do it. I would not know how to do it and I have no wish to do it. This is another important point for people to take into consideration. In brief, from my own perspective, I don’t have any of the qualities of abandonment and realization the previous Karmapas had. If I, even though I lack those, were to continue to pretend and deceive people, I feel that I would be accumulating severely negative karma. It doesn’t please me, or make me proud or over-confident enough to think that I’ll get rich, become powerful, and be liked by many people. Sometimes I think there’s no point. There’s no point in continuing to deceive others. Sometimes I think it would be better to just live as an ordinary person, an ordinary dharma practitioner. I sometimes think that, and especially recently, I have felt that strongly. This is because I have worked hard for many years, but I can’t work hard all by myself. A single pillar can’t hold up a building, can it? Everyone needs to work hard and help out. We say that everyone needs someone to take care of them. You can’t just be someone taking care of others; you also need someone to take care of you. Without support from others, there is no bringing benefit to the teachings and helping beings all by oneself. We Buddhists believe in karmic cause and effect. We believe in the view of interdependence. “Interdependence” means that all situations, no matter what they may be, occur because of multiple causes and conditions. There’s nothing that can be accomplished with a single cause and single condition. This is something that everyone needs to take into consideration. In brief, our Kagyu lineage in general and in particular the Karma Kamtsang is like a big family. In this family, the Gyalwang Karmapa is like the father. But the father can’t take all the responsibility alone. The support of all the members of the family is needed. Likewise if we think about the history of the Kagyu lineage, in particular the Karma Kamtsang, there have been many losses. For example, when the Mongol Gushri Khan invaded, his armies razed many Karma Kamtsang monasteries and many lineages of practice and explanation were lost. Such terrible events have occurred. Later, after 1959, there was the Cultural Revolution. Now we have the opportunity for the teachings to revive and flourish. I’d like to ask everyone to take this opportunity as your own and to make efforts. Sometimes people don’t seem to understand how I think. They seem to be unable to understand my perspective. It’s quite possible that this might happen. However, I think, the most important thing is that as I work I try to take a long-term view as much as possible —though I don’t claim to be able to see far into the future or to know how to think about the long term. Some people might not be able to take such a long-term view, but when there is a leader, once you believe in your leader, even though you might not immediately understand all their plans or why they make certain decisions, it is important to believe in them and support them. I’m not saying that you must support me. I’m not asking you to understand me. Rather, I think that this is a general thing: no matter who the leader may be in the future, people need to bear this in mind. So I will leave it here today. I have spoken about several different issues, and if I have made any mistakes or if I have said anything inappropriate, I beg your pardon. And now please dedicate whatever merit has been gathered during this Kagyu Monlam Chenmo for His Holiness the Dalai Lama to live long, for his wishes to be accomplished spontaneously, and for him to be able to set foot in Tibet soon and turn the vast and profound wheel of dharma. Likewise, dedicate it for the masters of all lineages to live long, for the sangha of the ten directions to be harmonious and have pure discipline, and so forth, as described in the Great Aspiration, which is next. Everyone, please make such aspirations and dedications.